డిస్ట్రిక్ట్ ఫీ రేగ్యులేషన్ కమిటీ(DFRC) అనుమతి తీసుకోవాలి. చేయరాదు.విద్యార్ధుల తల్లిదండ్రులకు నచ్చిన షాపులో కొనుగోలు చేయవచ్చు. పాఠశాలల బోర్డులపై ఇంటర్నేషనల్,ఐఐటి,ఒలంపియాడ్,కాన్సెప్ట్,ఈటెక్నో అనే తోకలేవి తగిలించరాదు.కేవలం పాఠశాల అని మాత్రమే పేర్కోనాలి. EXCEMPTION OF PENSION FROM ATTACHMENTS. Board of intermediate Education AP - Circualr on RC/RV March 2017 and IPASE May 2017 Exam Fee due dates. SGT's also eligible for SA promotions on par with pandits as per GO 12---APAT Orders. No. 36033/1/2013-Estt. (Ees.) OBC Cremilayor was subsequently raised to Rs. 4.5 lakh in 2008 and Rs. 6 lakh in 2013. G.O.Ms.No.80, Fin Dept, Dt.02.03.2009 LPS PETs upgradation. CRPS as enumaretotor for sadikara survay by collector. Rc.73/IT-Cell/2016 dt.3/6/2016 data base date extended upto 15-06-2016. Rc.02 dt 10.6.2016 schools reopen on June 13th. 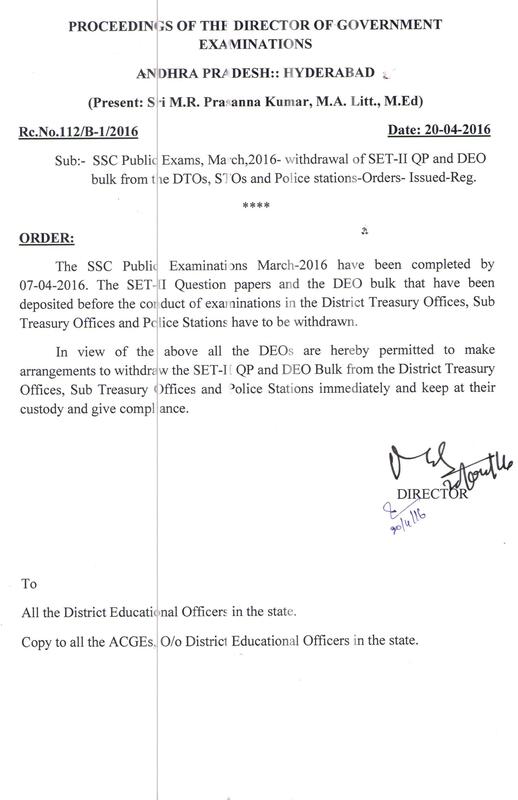 GO 27 Dt.30-4-2016 SSC Public Examinations, March 2016 – Enhancement of contingency charges. GO RT 566Dt.10.3.16. Ban imposed on all promotions, appointments, transfers. RC.710 Encashment Half pay leave to MP/ZP. RJD instructions to all HMS. G.O.6 Dt.23/01/15 ysr study circle name change as NTR VIDHYONNATHI. GO.26,Once Issued Community,Nativity,Date of Birth Certificate is Treated as Permanent Certificate and Guidelines. Passport NOC Application Form for Govt Employs. BADIBASA means Night Halt in School. Rc_181 BADI BASA in Schools Time Table & Schedule.Sinic Welfare Fund Go. Andhra Pradesh State Govt. released G.O.Ms.No. 52 on 25/02/2010 to implement Revised Pay Scales under Pay Revision Commssion (PRC) - 2010. Andhra Pradesh Revised Scales of Pay Rules, 2010 shall be deemed to have come into force on the 1st July, 2008.These rules shall apply to all the Government employees whether temporary, regular or permanent appointed before 1st July, 2008. 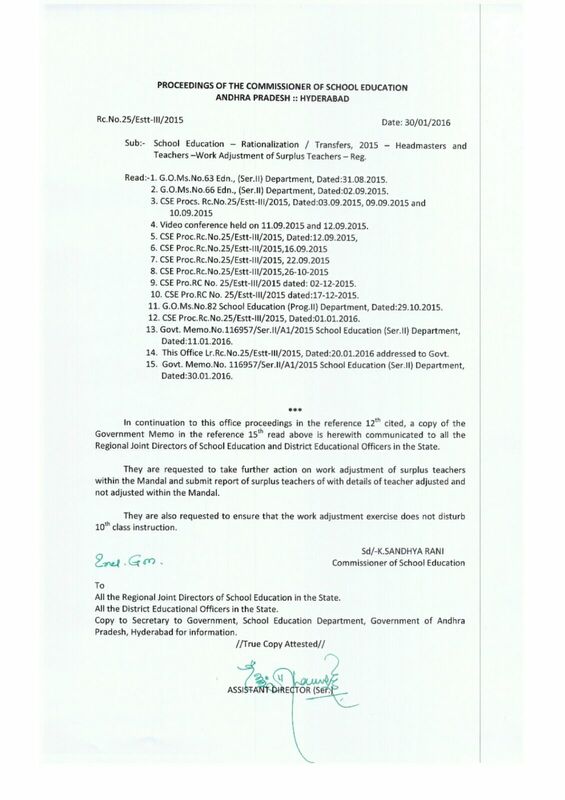 Rc.No.1570/C3-2/2010 01/10/2010 DSC-2008 – Permission to rationalize the vacant posts of SGTs in Primary and Upper Primary Schools (Govt/ZP/MP) to complete the DSC-2008 recruitment process–Information called for–Reg. 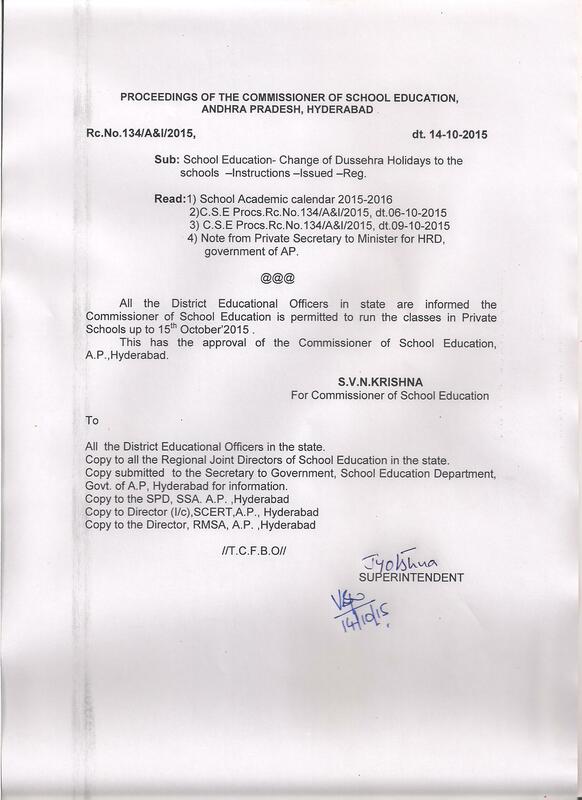 Rc.No.1671/D1-3/2009 04/08/2009 PRESS NOTE BY Commissioner & Director of School Education A.P.